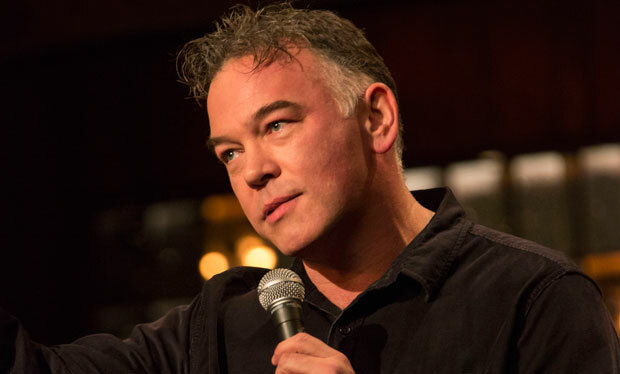 Stewart Lee has returned for a fourth series of his acclaimed, complicated and bellyachingly funny BBC2 comedy series Stewart Lee’s Comedy Vehicle – and now he has to deal with that success. 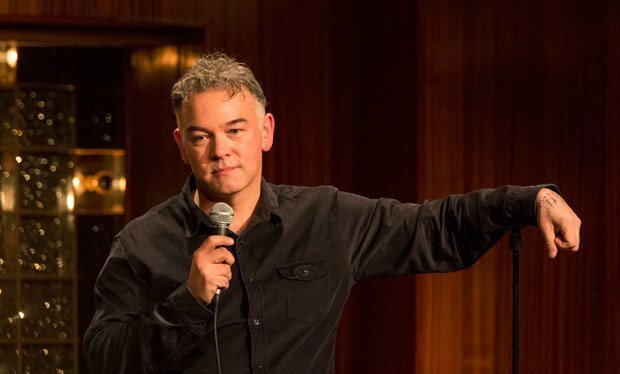 For those who haven’t seen it, the show is a stand up routine in which Lee adopts the persona of Stewart Lee – a kind of more idealistic, angrier and pettier version of himself – and performs in front of an audience. The first episode (Wealth) was last week and episode two (Islamaphobia) is on tonight. They are brilliant. The show offers a fascinating interplay between Lee and his live audience (“who are sort of trapped”), Lee and the audience at home (whom he frequently addresses by pointing his face at the camera) and, most importantly, between Lee and himself. It’s finely crafted, deeply nuanced stuff and the character has developed from series one where he was a man on the outside, trying to get in, having been given a BBC TV series and berating people who couldn’t recognise his genius. With four series now under his belt, the outsider shtick won’t rub, as Lee himself admits. 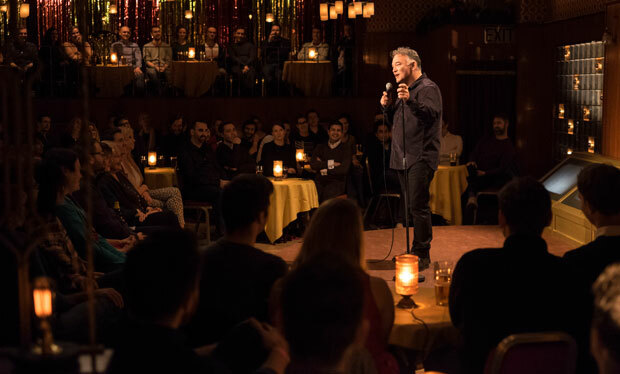 “I think a comedian has to be low status on some level, that gives you the right to do all sorts of jokes about all sorts of different kinds of people. But that idea was compromised because the series kept getting recommissioned which sort of lends me a degree of status. “If you look at the first couple of series I am much more arrogant on stage. And I could afford to be because the series was still a new thing. Now it’s more established you have got to undercut yourself even more. So you have a right to do jokes. So now I am making myself look like I am on the edge of losing it. In reality too, Lee’s audiences – the real Lee’s audiences – have swelled since his TV show. But instead of killing off the concept (as he feared) that has actually made it funnier and more complex. His frustrations as he struggles with his success are the point now. Truth and identity are elusive concepts in this universe, but Lee admits there are sections of his act where he deliberately tells good stand-up gags (despite having frequently taken apart more conventional comics like Lee Mack and Michael McIntyre) just to keep his hand in. Another problem with his increased professional success, is that he has become more recognised and says that the night before we spoke, he went out with a friend and their evening was ruined by people who kept coming up and talking to him. “It ruined my friend’s evening definitely and my night was sort of ruined,” he says. The use of a persona allows him to talk about his wife and children and family life, creating a scenario where he is performing in order to help support them and pay his mortgage. The reality is pretty close. In real life he and his wife, the award-winning comedian and writer Bridget Christie have two children. They talk about their stand up, of course, and obviously exchange ideas. But he’s been banned from seeing her last two shows. Meanwhile, a fifth series of Comedy Vehicle for Lee is a possibility but he is relaxed about it. “It depends on how long the BBC takes to tell me whether they want another one. A new tour could develop into a series or another long-term story tour. One thing he is sure about is that he wouldn’t want to do anything else. “I would like to carry on doing this into my mid to late 60s minimum. I am not going to write a play or do a novel or host anything or do a film. I would like to do this.